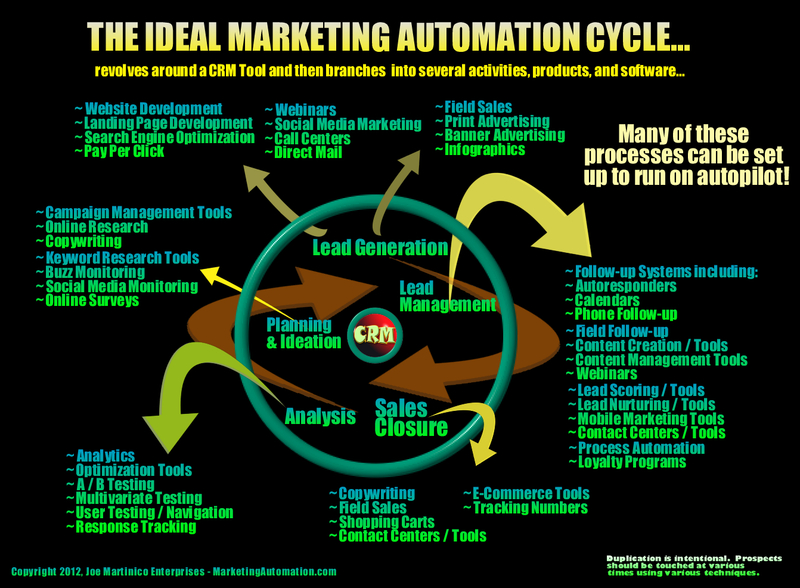 Chino Hills, CA, January 20, 201 – MarketingAutomation.com released “The Ideal Marketing Automation Cycle” today, an infographic that displays how a marketing automation program should work. Joe Martinico, publisher of MarketingAutomation.com stated, “The ideal marketing automation cycle revolves around a Customer Relationship Management (CRM) tool and then it branches into several activities, products, and software programs.” He pointed out that there are hundreds of marketing automation vendors and many of them claim to be total solutions, but that is rarely the case. Many businesses struggle to understand what marketing automation is, how it can help their business, and how to do it right. So, What Is Marketing Automation? The answer depends on who you ask. According to the infographic it starts with a CRM tool. Companies like Salesforce.com and Zoho.com provide this functionality for reasonable prices for any sized company. The very core of marketing automation requires that you keep good records of prospects and clients. This can only be accomplished if it is easy to add, import, and manage those records. Sales and customer support personnel should have easy access and good training up front. Once your CRM is in place then you can put together the tools necessary to do the rest. The idea is to visualize your prospects and your sales cycle and then develop campaigns that attract leads, ensure follow-up with a proper balance of automation and salespeople, and to make sales closure much easier. Mr. Martinico is passionate about the topic and claims that he’s seen companies double and triple their sales in short order by doing this properly. Amongst these functions are methods and tools that automate the process along the way all feeding information back into your CRM as they do so. Planning and ideation involve market research. By monitoring how people search on the Internet, marketers can peak into their customer’s minds and begin to understand their needs. Google provides keyword suggestions to marketers based on the terms that searchers use most frequently. Much of this research can be quantified and automated. There are also tools that monitor social networks and assist marketers to understand their prospects. This knowledge is key to writing good campaigns and deciding what should happen once a potential customer makes an inquiry. Marketers and salespeople often do the same things over and over again. It’s not that hard to consider what needs to be done and to automate these processes. 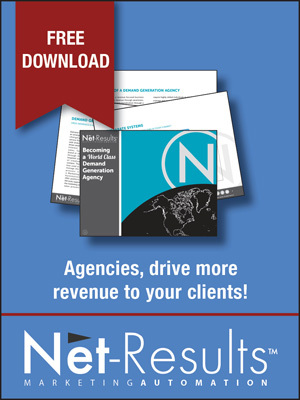 This gives salespeople more time to prospect and multiply their results. Once a campaign is developed and tested, marketers can begin to ramp up their lead generation activities and run more prospects through the system with the assurance that they will be taken care of and followed up on. The infographic contains methods both old and new to generate leads. Martinico emphasized that field sales, call centers, and direct marketing are still important methods of building leads. However, he suggested that if a company fails to look at new media, they are risking their very survival. Google sells over 20 billion dollars in advertising each year. This amount of revenue dwarfs most traditional media giants like Bloomberg and The New York Times who do a few hundred million each in advertising. So web pages, online advertising, and webinars are more important today than ever before. Lead management involves what happens to a lead once it comes in. There are over fourteen processes listed. Some leads can be closed right away, but there are often many more steps necessary and follow-up is many salespeople’s weakest link. So with good follow-up systems, leads can be scored and routed or trashed depending on what happened when they first inquired. In addition to that, “warm leads” that are not ready to buy right away can be “nurtured”, a process that involves sharing information with them over time using email, direct mail, webinars, and personal contact. The idea is to stagger and vary the contact methods so a prospect doesn’t feel pressured. Most important, the process is designed to build trust. It’s a lot easier to do that over a period of time. The process also keeps your company top of mind with prospects. When a prospect gets closer to being able to buy then they can be turned back over to sales or to your call center. Sales can be closed in person, over the phone, or on the Internet. The tools vary depending on the method but if the cycle is followed there will be more sales and closure will go more smoothly because the prospect will know the company better and be better informed. Most important, they’ll be assured that the company is not fly by night because a relationship will have been built. The final step is the analysis. This process should be ongoing and integrated into most of the other parts. When an email is sent, you will know if a prospect opened or read it. You will know what messages they responded to the most. Analytics can test what messaging is most effective and help you to plan your way forward. Google has always supported “A/B Testing” a method where advertisers can test their ads against one another and use the winning ad as a control for future testing. If a merchant continues this process, the idea is that, at some point, they will be using the messaging that produces the best result. Many marketing automation solutions have built in testing that helps continuous improvement. MarketingAutomation.com provides current information, tips, and ideas for small and medium sized businesses who want to automate their sales and marketing functions. Although it is one of the most valuable processes to automate, marketing is also often the most difficult. 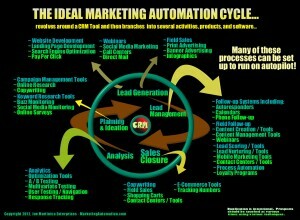 MarketingAutomation.com’s infographic, “The Ideal Marketing Automation Cycle“, allows small business owners to understand what marketing automation should do. 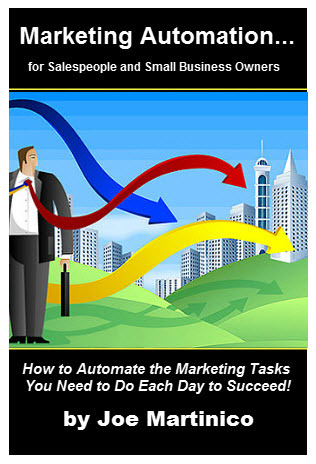 It is also a great tool for marketing automation vendors to use in the sales process. If you are in the in the industry and would like a PDF of this infographic, please contact us here.